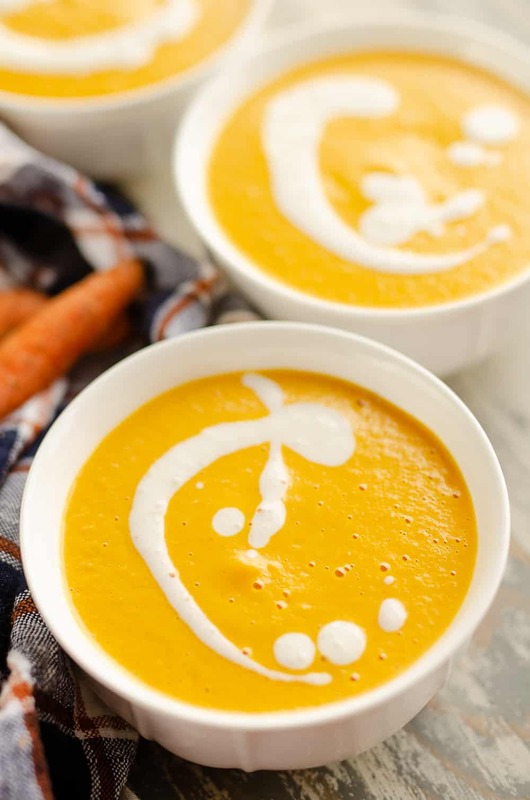 Pressure Cooker Creamy Carrot Soup is a rich and delicious 20 minute vegetarian soup recipe made in your Instant Pot! 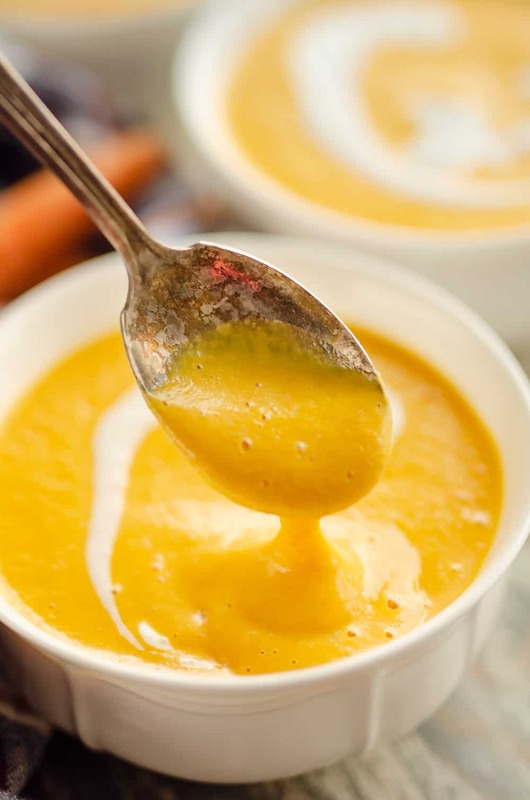 Carrots, onion, apple, ginger and cream cheese all come together in your blender to make this amazingly smooth and flavorful soup. Never in a million years did I think, my vegetable adverse self, would love carrot soup. Similar to my discovery of my love for Butternut Squash Soup, I first tried it while working as a server in a fine dining restaurant during college. Carrot Ginger Soup was the special of the day, so we had to give it a try to sell to the customers. I was certain I would HATE it. I can’t stand cooked carrots, so why in the world would I like a soup almost entirely made from it?! Well, needles to say I was actually a big fan. 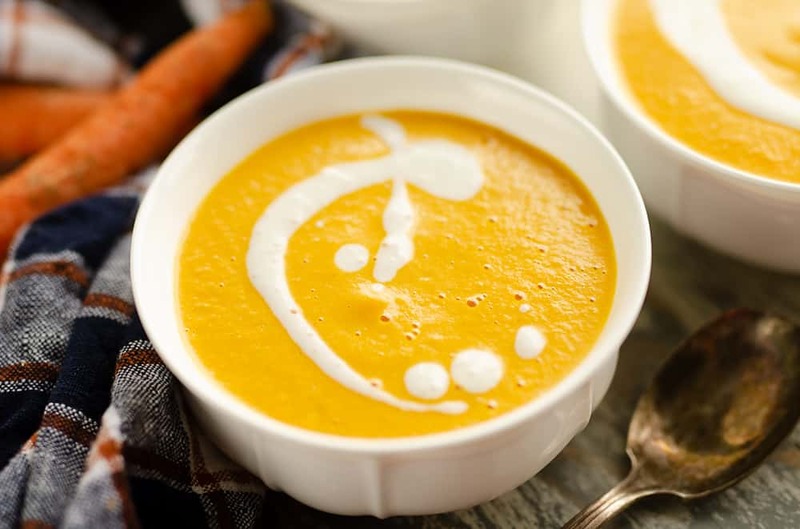 It has been countless years so my fine dining days, so I decided to make this Pressure Cooker Creamy Carrot Soup with a bunch of carrots I had sitting in the refrigerator. 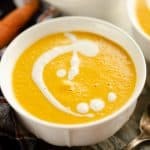 While this Pressure Cooker Creamy Carrot Soup has some cream cheese in it to make it rich and delicious, it is still a relatively healthy recipe seeing it is loaded with so many vegetables and fruit. It starts out on the saute function in the Instant Pot with some onions cooking up in butter. Toss in a bag of peeled carrots, a peeled and chopped apple, some grated ginger, dried thyme, salt and chicken stock and you are good to go. Pop the lid on your Pressure Cooker and let it cook for 5 minutes under high pressure to really soften up the vegetables. 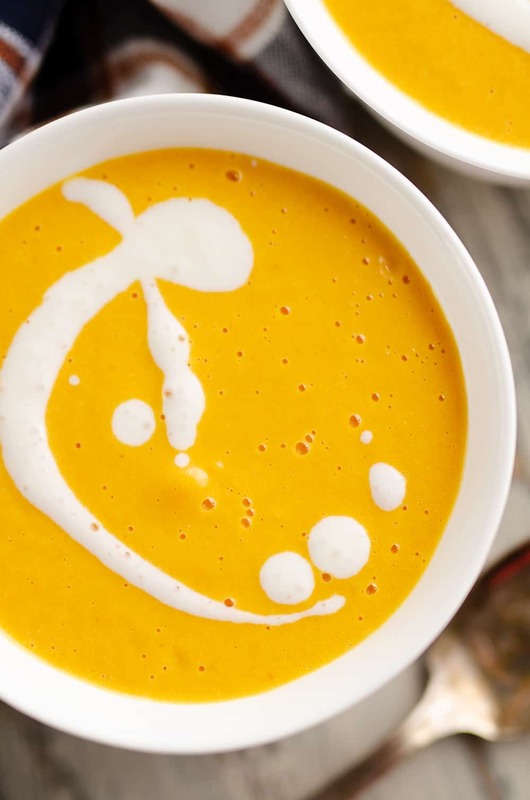 Do a quick release of the pressure and it’s time to blend it up into velvety smooth soup. I am a huge fan of immersion blenders because they make quick and easy work out of blending up sauces, dressings and so much more. When you are looking to get an ultra smooth soup texture, they aren’t necessarily the best option though. They do an alright job, but they just don’t get the soup completely smooth. It is most definitely worth the extra 5 minutes it take to transfer the soup in batches into your regular blender. While it is tempting to skip this cumbersome step, I promise it will be worth it when you take that first bite! I finally too the plunge and got this Refurbished Vitamix, but my old Ninja Blender did a great job too. The biggest upside to the Vitamix is that it is much quieter and doesn’t make my babies jump out of their seats in tears! Not that has ever happened at all…woops! Turn your pressure cooker to saute and add the butter. Cook until melted and add the diced onions. Add all of the remaining ingredients except the cream cheese to the pot and cook and close the lid and turn the valve to seal. Cook on high pressure for 5 minutes. Do a quick pressure release and add everything to a blender. Once smooth, add the cream cheese to the blender and blend on high for 2-3 minutes until everything is well blended. Optionally garnish with creme fraiche. 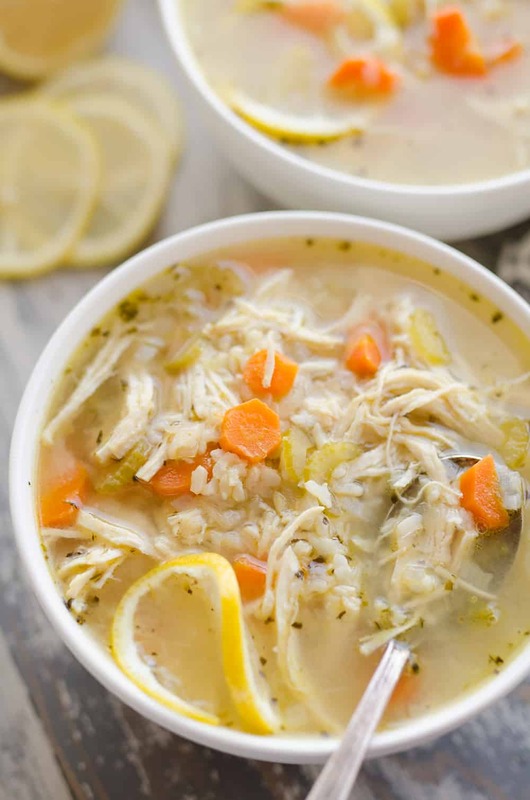 More amazing Pressure Cooker soup recipes! YUMMY!! 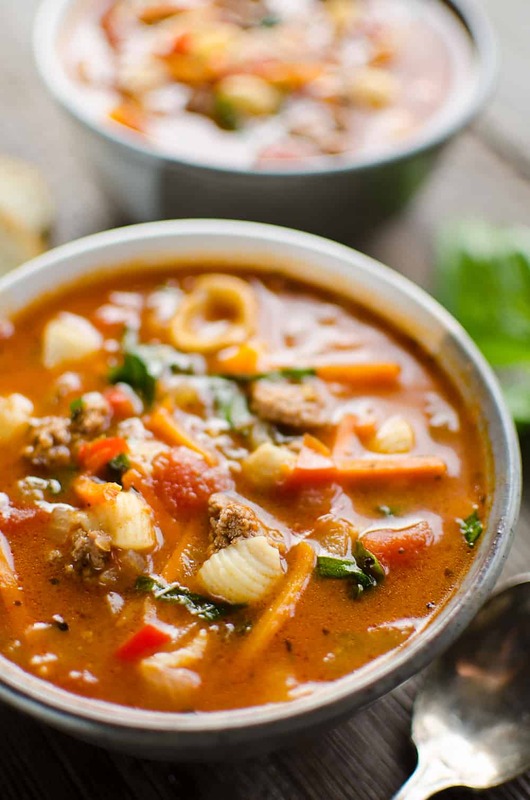 This would be such a wonderful soup to make in the fall!! Looks very delicious!! 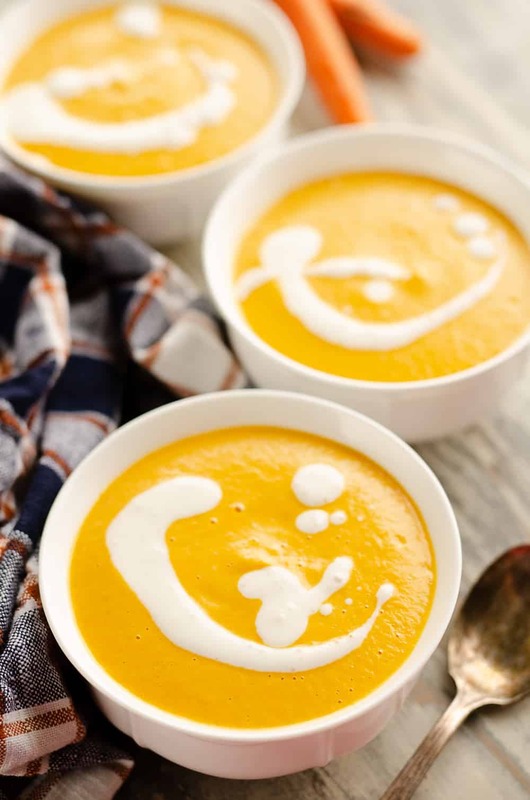 What a yummy and creamy looking soup! I can’t wait for fall weather and all the soup!! Oh my gosh, I totally need to do this with all the carrots in my garden! This sounds amazing! This sounds so hearty and comforting! I can’t wait to try this! This soup grabbed my attention and with two minutes left to go I’ve got a question…… Can leftovers be served the next day?